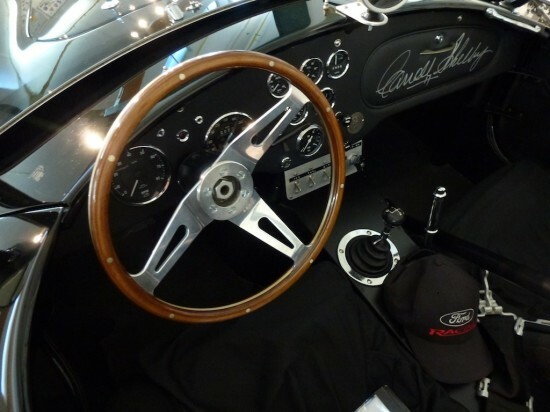 Here are pictures of Shelby (AC) Cobra CSX 2001. Yes, this is the first production Cobra made, now owned by Bruce Meyer. In July 1962 this car was shipped to the dealer Ed Hugus of European Cars in Pittsburg, Pennsylvania. Ed Hugus installed the engine and transmission and made the car road worthy. This Cobra went through a couple of owners, was modified to racing specs and then sold to an owner in France where it spent its time either racing or being driven on the street until Bruce Meyer discovered this special Cobra in 2006 and brought it to California. It originally had a 260 cid engine but was later fitted with a 289 cid engine for racing, which is the engine it has today. Rack and pinion steering was also added. Bruce Meyer had the car painted black but it retains its original chassis and interior. The seats in these pictures are covered. Read more about Cobra and Tiger and a Cobra 289. Just a slight correction on your article. It was Continental Cars on West Liberty Ave. not European. I know, because I worked on building this car.